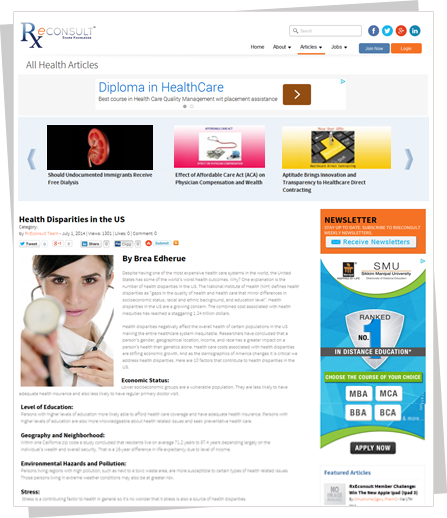 Increase your popularity by publishing health articles. Build your reputation and network. Find healthcare jobs or grow your business. RxEconsult is a community of opportunity open to everyone. All the tools you need for healthcare success are right at your fingertips. Want to learn more? Explore the countless opportunities available on this site by taking the following tour. Kick your career search off right by utilizing every new tool at your disposal. If you want to get the most from RxEconsult, first complete your profile so other members can easily find you and begin networking right away. When you are ready, add more detailed information about your expertise or company by adding documents such as your resume, your company brochure, your publications, new articles and other content. Getting noticed in healthcare is easy with RxEconsult, and submitting an article on a topic of your choice is a great way to demonstrate your expertise. Your articles are attributed to you, link to your profile, and are indexed by search engines. In fact, many RxEconsult articles are listed on page 1 of Google search results. Articles should be at least 400 words and can address a wide range of subjects including: medications; clinical/medical information; healthcare-related business and career information; your personal healthcare experience; healthcare pearls; and healthcare news. By sharing your knowledge, your audience will be large and growing. Whether you want to add new talent to your healthcare team or you're seeking a new position, RxEconsult is the premier portal on the web for healthcare related jobs. Here you'll connect with high-quality people – job seekers who are not listed anywhere else. If you're job hunting, we'll show you openings from over 25,000 websites. Either way, it's easy to do. Are you a job seeker? Simply build your personal profile and post a current resume. Then you can add new information, post examples of your work or a video that shows your strengths. Recruiters post healthcare jobs and related opportunities for no charge by visiting our recruiters page. 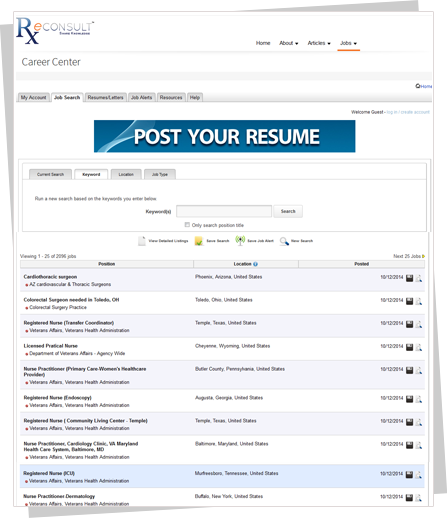 We also provide access to more than 25,000 partner job sites on the RxEconsult platform. There is a small fee for posting positions on our partner sites. With RxEconsult, you'll plug in to our high-quality, diverse and ever-expanding global online healthcare community, including professionals, businesses and organizations, solutions providers and service providers. Getting involved in the RxEconsult community is easy. Become a member and start participating. You can join a forum, write an article, upload a video, post a job, describe your business, or partner with other members. At RxEconsult, we know the value of common effort. A Network for All Healthcare Professionals and Businesses to Succeed.